NUL[EXTRACT]As fabulous as folded napkin cranes and fans that once graced many a restaurant tabletop are, there is something special about a table setting with napkin rings. Consider them jewelry for your table linens — there’s even a ring in the name. Dinnerware and glassware are beautiful in form and in material, while table linens bring color and graphics to the table. A napkin ring is the piece of the place setting puzzle that really takes all decorative components and simmers them down to produce a single, intense, decorative jewel. 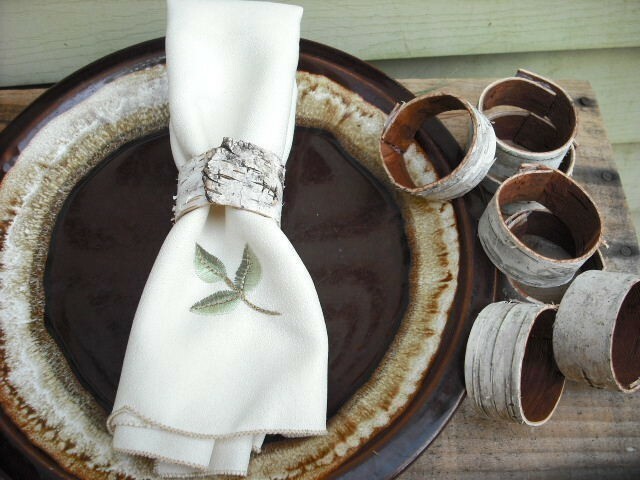 In essence, the theme to the table setting becomes apparent simply through the napkin ring selection alone. What color or style napkin ring should you consider? For those of you with a color phobia, a single moment of red, or a small flash of gold can perfectly accent an all white tablescape without overwhelming your inner minimalist and monochromatic palette. Due to its size, a napkin ring is really impossible to overdo. If you do have a dislike of all things over the top, the napkin ring is the first challenge to overcoming or combating that. It may be one small step for decorating mankind, but a nudge in the right direction for tackling bold accents. What style napkins are there? Because a napkin can instantly transform a table setting, consider purchasing neutral sets of table linens to create a subtle background base for your table decor. With plenty of options to choose from depending on the material and style, have fun by changing out your napkin rings and centerpiece designs depending on the holiday or occasion.Find napkin rings design ideas here.